Either it is about the snow-capped mountains, the beautiful lakes or a perfect leisure spending place, Pokhara never disappoints the tourists. Pokhara offers a variety of choices for the visitors. This may include trekking, sightseeing, experiencing the culture, shopping in the local market, mountain biking and many ways to chill. Pokhara offers a number of trekking possibilities for the tourists. The Poonhill trek, Ghandruk Trek, Mardi Himal Trek, Khopra Danda Trek, and Upper Mustang Trek are some of the beautiful trekking routes in Nepal that can be started from Pokhara. Pokhara is also very popular as the starting point of the famous Annapurna Circuit Trek. However, Pokhara also offers with the beautiful trek inside the valley. The Phewa Circuit Trek is one of such trek one should not miss. The Phewa Circuit Trek offers wonderful views of the mountains from a gentle height and not very far from the city area. The beautiful countryside view and friendly locals make the trek more worthy. The short Phewa Circuit Trek will lead you through the tropical forest with the highest elevation of 2,760 meters at Panchase. The beautiful Rhododendron, orchid, fern and the chipping of the birds give the untouched feeling of the countryside. 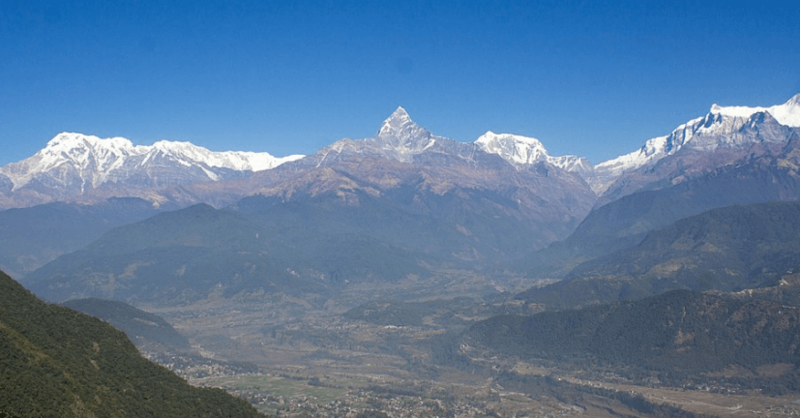 The glorious mountain peaks: Annapurna, Machhapuchhare, Dhaulagiri, and other peaks. 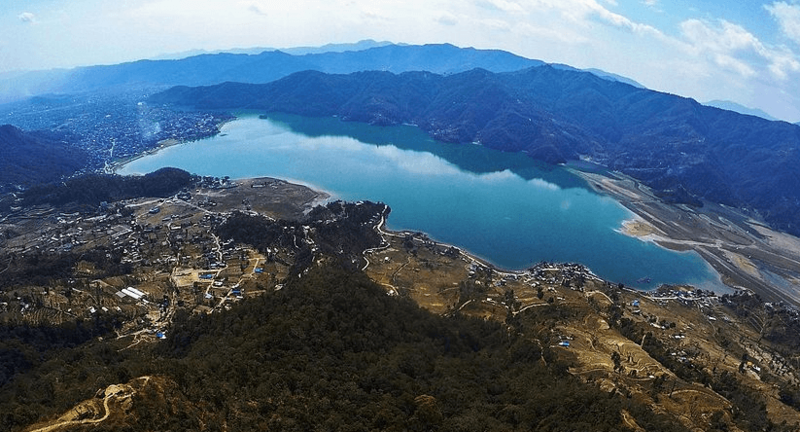 Phewa Lake is not only the attraction of the Phewa Circuit Trek but is a preferred destination in whole Pokhara itself. The lake lies at the altitude of 742 meters and extends over an area of 4.43 sq km. The Phewa Lake has a beautiful and peaceful environment. The crystal clear reflection of the Machhapuchhare Himal and other mountains of Annapurna and Dhaulagiri ranges on the surface of the lake is a major factor that makes the Lake enchanting. Multicolored boats add an extra light to the lake. You can take a boat tour around the lake. The boats are available anytime at the bank of the lake. The Barahi temple at the middle of the pond is another attraction. You can hire a boat and make a tour to the Barahi temple. Floating on the surface of the beautiful lake with the panorama of the snowcapped mountains overhead is one of the best nature experience you will ever get. The temple is two-storied, pagoda style temple and is the representation of Ajima; the female force. A number of devotees visit the temple particularly in Saturday. The Phewa Lake is more like a piece of heaven on earth. The evening walk around the lake or evening boating is accompanied by the beautiful sunset. The colorful sunset over the sky is worth watching from the Fewa Lake. The southern bank of the Phewa Lake offers the way towards the World Peace Pagoda. The trail is straight uphill climb following the stone steps. 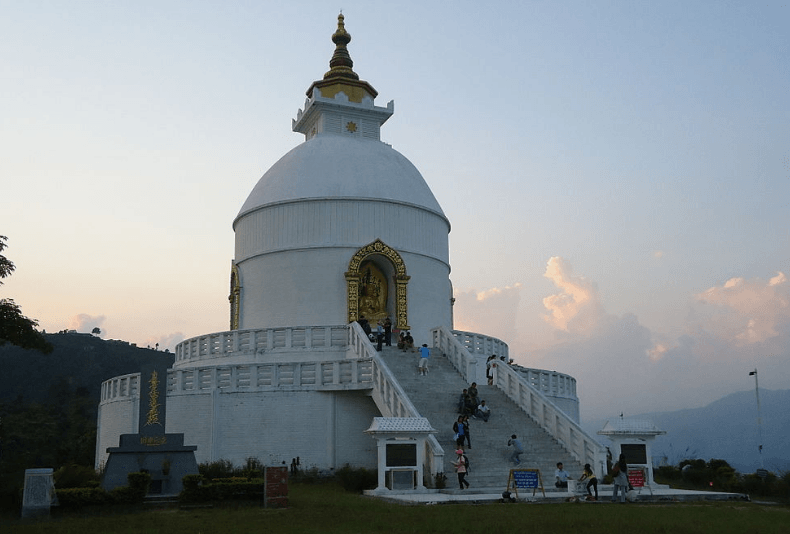 Only 7 km away from Pokhara, the world peace pagoda is mostly popular as the viewpoint of the sunrise and sunset. The interesting trip to the pagoda starts from the Pardi Khola Bridge. Crossing the bridge, passing through the paddy fields and greenery, the trail will lead you to a small temple. You will also see a poultry farm on the way on your left. Again walking about 2 km through the beautiful forest, the main trail continues in the west. There also exists an alternative trail which is about 600 m from the gate that will lead you up to the main ridge. Both the trails meet uphill and you will now reach the restaurant where the trail from Devi’s fall joins. With the beautiful view of the surrounding you will finally reach the peace pagoda. For an even shorter route, trekkers can also hire a taxi or get a local bus that can drop you by the bus park at the south of the stupa. The steep trail for less than an hour leads to the entrance of the pagoda. If you are really looking for a hot, sweaty, workout type of hike, then hike from the Devis Falls is a good idea. Panchase is 28 kilometers from Pokhara. Resting on the foothills of the Himalayas, Panchase is one of the attractive trekking destinations in Nepal. The trek is simple, low altitude trek and thus is suitable for any age group without any special requirements. Along with the beautiful mountains along the trail, the Panchase trek offers the trekkers with the historical, cultural and religious experience. The trail passes through the subtropical to temperate forest which is home to a number of endangered bird species. You might also encounter some monkeys. The Panchase Peak is 500 meters up which can be conquered by the stone trail. The peak is also called Pancha Dham because of its religious importance. The Panchase peak is the highest peak around the Phewa Circuit Trek. The early morning in the Panchase peak is wonderful to experience the beautiful sunrise. The red sun rays spreading over the mountain peaks of the Dhaulagiri, Annapurna, Manaslu and Ganesh Himal makes the horizon look like heaven. Want to Know More about Trekking inside the Beautiful City Pokhara? At the altitude of 1600 meters, Sarangkot is the viewpoint and is particularly famous for the sunrise and sunset. A short trek to the top of the hill will be perfect in the morning or the evening. The trek is little but challenging and starts from the north of the Lakeside through the Kahare. Following the road from Kahare, the trail will lead to the Sedi Bogar village. Right from the Caravan Restaurant and continuing through the stone road, you will reach the forested slopes of the Sarangkot. The road ends there at the right side (east) of the school and thus you now need to follow the next trail. After walking for about 100 meters, the trail breaks to the left and then the stone steps begin again. Walking along the stone steps through the long jungle and passing through the small villages, trekkers can catch a sight of paved roads with some restaurants nearby. There also stands a school. You are now almost done but this is not the end of the trail though. From here, a 200 meters walk down the road and a 100-meter on the left will lead to the steps from where the top is visible. Sarangkot village lies at the top with many restaurants, cafes, and shops. The top of the hill offers majestic views of the glorious mountains namely Dhaulagiri (8,167 m) in the west, Pyramids of Machhapuchhare (6,997 m), and Annapurna II (7,937 m) in the east. Take a long, satisfied breathe and get lost in the magical views of the mountains. The third largest lake of Nepal; the Begnas lake lies in the southeast of Pokhara and 35 km east of the tourist center at Phewa Lake. Begnas Lake is a quiet and peaceful place to spend some quality time in. The Begnas Lake provides an opportunity to have some time close to the nature on the lap of the Annapurna range. You can also hire a boat and paddle around the lake during the beautiful evening enjoying the sunset. Begnaskot is a ridge towards the northeast of the Begnas Lake. The hike to the Begnaskot is a firsthand experience to the countryside lifestyle and mountain culture. The Sundari Danda village that occurs in the trail while climbing for the Begnaskot is a beautiful instance of the agricultural tourism in Nepal. The village is composed of different groups where the people are involved in agriculture, fishing and coffee production. There is also an organic fresh coffee farm that offers fresh coffee. At the top of the Begnaskot, there is a temple. The temple is called the Begnaskot temple and is especially important for the Hindus. The hill top provides the view of the beautiful Pokhara valley, the lush green forest and different mountain ranges. This trekking route is less explored and is rarely visited by the tourists. Thus, the trail is quiet and peaceful.